Today's prom night venues are only limited by your imagination and prom budget. If you want to create a memorable event fit for teen prom royalty, start by finding the ultimate prom venue. Standard event locations and unique venues require advanced booking, particularly if you live in an urban or suburban location. Plan to reserve your venue six months to a year in advance. Not all high school students drive, meaning parents might be providing the transportation. Because of this, you don't want to plan for your prom to be too far away. Look for a location within thirty minutes of the high school. The same is true for kids taking limos and car services who might charge by the mile. Everyone knows prom is supposed to be fun, but it also needs to be safe for teens. Steer clear of any venues that might be hosting other adult parties on the same night such as hotels with multiple banquet rooms. 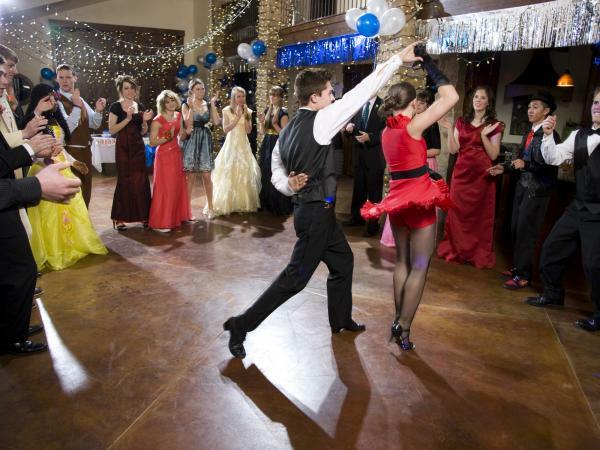 Look for locations with a big party room and not many other places teens can sneak off to. Like other large party events, prom spaces need to include room for sitting, dancing, a DJ, and food and beverage stations. Make a list of the different sections you plan to have at your prom and look for spaces that fit your setup. The first thing you need to look at in possible prom venues is the capacity of the room that is available to rent. It should comfortably fit the maximum amount of people that could be attending. Look at the number of tickets sold for prom the past three years and find the average of those numbers to estimate how many people will attend this year. Providing this all fits within your prom budget, the next step in planning the prom is choosing a date. If this was already decided, you only need to make sure the desired prom venue isn't booked for the chosen date. If it hasn't been chosen yet, it's a matter of coordinating the available venue dates with the available dates for the school.